TOTTORI (Kyodo) Brain tissue has been found in three human skulls dating back to the second century that were unearthed last year in Tottori Prefecture, researchers said Monday. The discovery is believed to be the first of its kind in Japan, they said. The brain tissue, which was well preserved, was found in the skulls of two men and one woman, according to the Tottori education and culture foundation. Because brain tissue decomposes quickly, it is rare to find it in ancient skulls, said Takao Inoue, professor of anatomy at Tottori University School of Medicine. Inoue and other researchers at the university are expected to take nuclear DNA samples from the tissue to analyze the human leukocyte antigen, a pattern of white blood corpuscles. Should they succeed, they will be able to shed light on the ancient people's hereditary diseases, physique and hair characteristics, Inoue said, adding that findings of this nature will help to clarify the origins of the people who lived in the Yayoi Period (from 300 B.C. to 300). One skull, believed to be from a middle-aged man, contains about 230 grams of tissue, or about 20 percent of his total brain mass. 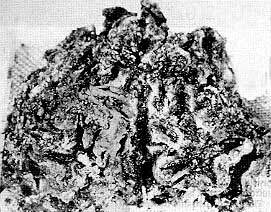 Wrinkles on the surface of the darkened tissue are clearly visible, Inoue said, adding that the presence of minute nerve fibers was confirmed by electron microscope analysis. The skull believed to be that of a middle-aged woman holds about 300 grams of brain tissue, or roughly 25 percent of her brain. Inoue said all three are believed to have been killed and buried, as the skull of one of the men shows signs of having been struck. "There have been some examples of brain tissue found in previously unearthed skulls, but this is the first clear case in Japan," he said. Brain tissue was discovered in a Florida peat bog in the 1980s in more than 260 human skulls that were estimated to be around 7,000 to 8,000 years old. The tissue in the three Yayoi skulls was preserved because the damp clay soil in the area effectively shut out oxygen, slowing the decomposition process. The skulls were found at the Aoya-Kamijichi ruins in the town of Aoya in the eastern part of the prefecture in May. Inoue said the tissue is being preserved at a temperature between minus 5 and zero degrees, with analysis expected to take several years. Kazuro Hanihara, a professor emeritus at the University of Tokyo, said, "As far as I know, it is the first time for Yayoi Period brain tissue in near-living condition to be found." He said the find represents a precious opportunity to conduct direct anatomical research on the brains of the ancestors of modern Japanese. Toshinobu Fujiyoshi, an associate professor of virology at Kagoshima University, said there is only one pair of nuclear DNA in one cell and there are not many examples of extraction as they are susceptible to microbes, compared with mitochondrial DNA, which are more commonly used for DNA analysis. "If successful, (the brain tissue) will become important evidence to find out where Yayoi people came from," Fujiyoshi said. The Aoya-Kamijichi ruins are known in archaeological circles as "an underground museum of the Yayoi Period" following the discovery of various artifacts, including hunting tools, at the location. ruins last year in Tottori Prefecture.